With leaders of the 20 largest economies planning to double global infrastructure investment by 2030, scientists are urging lenders, aid agencies and government ministries to carefully examine new projects before committing funds in order to limit the “devastating” impacts these projects could have on ecosystems. At the November 2014 G20 meeting, governments committed $60-70 trillion to new infrastructure projects, on track to be the biggest financial transaction in human history. “We’re living in the most explosive era of infrastructure expansion in human history… [there will be] an unprecedented avalanche of projects,” said Professor Bill Laurance from James Cook University in Australia and lead author of a recent review in Current Biology. By the middle of this century, there will be 25 million kilometres of newly paved highways – enough to go encircle the world more than 600 times, current projections suggest. Around 90% of these roads will be built in developing nations. Roads can pave the way towards greater social and economic growth, enabling rural communities to easily access health care, schools and employment as well as greater national and international trade, energy, agriculture and transportation links. However many studies show that when new roads are built, a veritable “Pandora’s box effect” occurs. Forests are permanently converted to other uses, animals are hunted to extinction, land is locked up by speculators, farmland becomes inaccessible, illegal and dangerous mining is rife, and wildfires proliferate. “Roads are like a metastasising cancer,” Laurance said. Laurance et al. 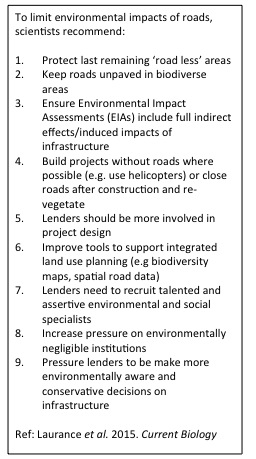 have published nine recommendations for government, lenders NGOs and the public (see box) that they believe will help limit environmental impacts of roads – from keeping areas “roadless” to increasing offshore natural resource projects where employees travel by helicopter rather than car. However there are a “juggernaut of investors lurking to push these projects through even if responsible lenders say no,” said Professor Alan Ziegler from the National University of Singapore and co-author of a 2012 Nature Geoscience article that says lenders often don’t truly understand the impacts of road networks they support. would do it more cheaply and with less environmental consideration. There is a dire need for governmental and non-governmental organisations to increase pressure on institutions with unscrupulous environmental safeguards, such as The Asian Infrastructure Investment Bank and The Brazilian Development Bank, the Current Biology paper says. “The recommendations speak to any country at any time…in many places, roads and dams are now being decommissioned because people now see they were a mistake to build in the first place,” said Ziegler. Laurance and colleagues have also published a global strategy that details where on the earth roads should and should not go. 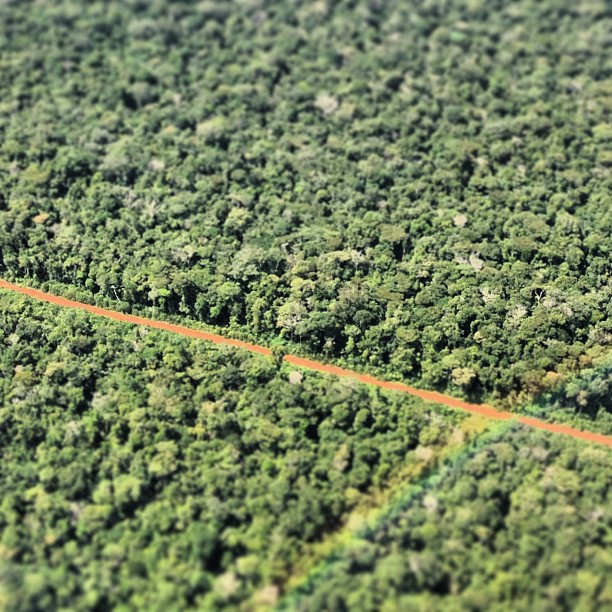 “In theory, it’s possible to design the global road system to maximise human economic and social benefits while protecting biodiverse and carbon-rich areas,“ Laurance said.